Ravensdale Lodge awarded the A.I.R.E Failte Ireland Equestrian Tourism Classification. Ravensdale Lodge Making the News & Setting the Trends. Ravensdale Lodge has featured in many National and International press & travel features. The centres iconic images have been used to promote Irelands tourism product around the world by Failte Ireland, Irelands Tourism Body and dont be surprised to see us on "the back of the bus" promoting what is on offer on Dublins doorstep. Featured on two occassions on Irelands favourite travel programme, "No Froniers" in 2003 & 2010 and in National publications such as The Irish Times, The Irish Independent, The Irish Mail, The Irish Field,The Guardian in England as well as major European and American travel publications. Ravensdale Lodge plays host to many National and International press association groups who want to sample the delights of horse back riding while taking in some of the most stunning scenery Ireland has to offer. 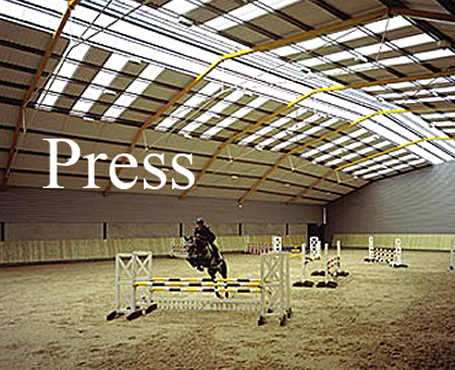 To see our most recent press articles view the "Press" section on our blog. National Enterprise Award Winners 1997,2002 & 2007. Nominated for "Show of the Year" 2009, 2010, 2011 & 2012.